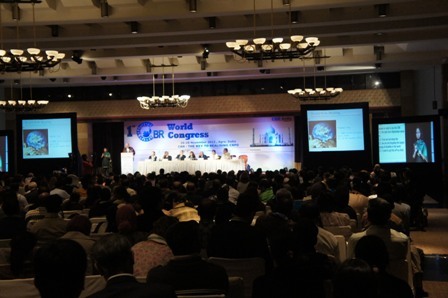 The first CBR World Congress was organized in Agra by the CBR India Network in collaboration with the World Health Organization (WHO), the Australian Agency for International Development (AusAID), the United States Agency for International Development (USAID), CBM and Sightsavers. The Congress, which ran from 26 to 28 November 2012, was attended by more than 1,200 delegates from 85 countries. In line with the principles of the United Nations Convention on the Rights of Persons with Disabilities (CRPD) and other key international documents, participants intensively discussed international perspectives on CBR during the 3-day meeting. One of the tangible outcomes was to establish a global initiative, the CBR Global Network, through the joint efforts of United Nations agencies, WHO in particular; the CBR Africa Network (CAN); the CBR Americas Network (CAsN); the CBR Asia-Pacific Network (CAPN); the International Disability Alliance (IDA); the International Disability and Development Consortium (IDDC); and the Asia-Pacific Development Center on Disability (APCD). In closing, the Agra Declaration was presented and unanimously adopted by all participants of the First CBR World Congress on 28 November 2012. The first regional meeting for the Japan-ASEAN Integration Fund (JAIF) Project, “JAIF Project Regional Meeting” was organized by the Asia Pacific Center for Disability (APCD) from 6 to 7 December 2012 in Pattaya, Thailand. Several honorable guests, including H.E. Ambassador Mr. Le Luong Minh, Incoming Secretary General of ASEAN and the Vice Minister, Ministry of Foreign Affairs of Vietnam, kindly voiced the importance of the APCD/JAIF Project to the region. The APCD/JAIF Project aims to improve the overall quality of life and well-being of persons with disabilities in the ASEAN region. The Project’s focus is to establish model projects in local communities in Cambodia, Lao PDR, Myanmar, and Vietnam (CLMV). More than 90 delegates from ASEAN member countries and Japan came together to learn more about the Project, share disability related experiences, particularly on non-handicapping environments, and plan the Project’s implementation. The delegates worked in four groups (CLMV) with a focus on multi-sectoral collaboration and approaches. Discussions included how the collaboration of national and local governments, disabled people’s organizations, media, and NGO delegates can be developed in terms of procedures, structures and roles. Other ASEAN countries provided support to the four countries during the sessions. These discussions will be further developed during the Steering Committee Meeting which is scheduled in early 2013. In closing, the Pattaya Recommendations on Community-based Inclusive Development was adopted by all participants of the Regional Meeting. Online Master’s Degree by IDPP! The Asia-Pacific Development Center on Disability (APCD) has been collaborating with several prominent universities through the Institute on Disability and Public Policy for the ASEAN Region (IDPP). Currently, the IDPP is accepting applications for Fall 2013 entrance. Admission to the Master's in Comparative and International Disability Policy (CIDP) degree program through American University's School of International Service (SIS) is open. Applicants who are residents of an ASEAN country and living with disabilities could be eligible for The Nippon Foundation (TNF) fellowships. The priority deadline is 15 January 2013. Any other details are available from below. We very much appreciate your support for APCD and its activities in 2012. We will continue our efforts in the coming New Year to promote a barrier-free, inclusive and rights-based society for all through the empowerment of persons with disabilities and their organizations. Happy year’s end and wishing you the very best for 2013! !